I was very intrigued by this post over on The Grocery Cart Challenge. From now on, I won't be throwing my lint away anymore!! I think that composting it and using it as a fire starter will probably be our most common uses, but I can imagine myself making Chloe Mae some clay out of it in a couple years or working on a papier-mache project together. We're lucky enough to have the perfect spot for the rain barrel right next to the garden. And there was just enough room for the compost bin in the garden, between the garage and our asparagus. The added bonus?? I think both will save us some money in the long run. We're thinking about doing away with our trash service. Composting should cut down on the garbage we produce, which is already minimal, and what we do produce shouldn't be very stinky, since there will be very little food-products in it. So we can "save it up" and take it to the Resource Recovery Plant by the vehicle-ful for a small fee or on the twice yearly free days - even better!! The savings from the Rain Barrel are obvious, since any water we use from there we won't be paying water and sewer charges on. Thanks to the rebate offered by the Smart Watersheds program, it was a small investment to start with!! 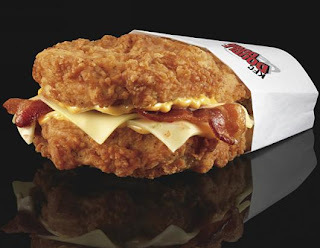 This is Kentucky Fried Chicken's newest "sandwich." It's called the Double Down. There are 2 fried chicken filets as the 'bun', with 2 strips of bacon, monteray and pepper jack cheese and a zesty sauce inside. While I realize that there are plenty of other fast food options out on the market that are probably even higher in calories/fat/all that bad stuff, seeing the large banner for this particular offering just made me cringe. I thought, "No wonder almost 2/3 of American adults are overweight!!" We already try to avoid having fast food very often and when we do, Aaron and I usually try to split something. After seeing this, I'll be watching what we (I) eat even closer. This makes me look forward to garden season even more. We rarely ever eat out in the summer when we have a garden full of veggies we can eat at home!! 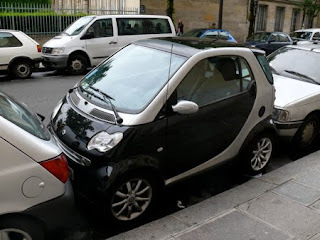 That crazy teacher did teach me how to effectively parallel park though. Pull up even with the steering wheel of the vehicle in front of the spot you want. Turn your steering wheel 1.5 rotations towards the spot and start backing in, until you're even with the back of the vehicle in front of you. Then straighten out your wheel and continue going straight back until the front of your vehicle is even with the back of the vehicle in front of you. Turn the steering wheel counter-clockwise and continue going back until you're straight in the spot. Finally, pull forward to center yourself in the spot if necessary. It works, every time, no fail - even in my new, bigger vehicle!! Every winter as it gets darker and darker when I'm leaving work at 5PM, I listen to people talk about how much they hate going home in the dark. I listen and try to empathize, saying something along the lines of, "Yeah, it's a real bummer." Truth be told, I don't really mind it too much. It's usually cold enough by then that I'm not going outside at night anyhow. However, this time of year, when the sunshine at 5PM is returning, it's a whole 'nother story. I love walking out of work and seeing the light again. It gives me an extra bounce in my step and puts me in a better mood. It's still cold enough that I'm not going outside after work, but it's the first sign that spring is just around the corner. Today would have been my 6th anniversary at Gateway Hotel if I still worked there. But I don't, and I'm okay with that now. We had a tumultuous 1+ year, but I truly think that everything worked out the way it was supposed to. Even if it was hard (if not impossible) to think that at the time. For a few months, I hated getting the mail, because there was always the possibility of another rejection letter. It was heart-wrenching and usually required a full box of cookies before I started feeling better about things. Looking back, I can say it was all worth it to end up where we are today. -Late September of 2008 I found out I'd be losing my job. -Early October we found out we were finally pregnant. -January of 2009 I was officially unemployed. -From February through the end of April I worked as a temp at a tax agency. -The middle of May I had my beautiful baby girl. -August 10 I started my job with the City of Ames. Chloe was exactly 12 weeks old when I went to work and I feel very lucky that I got to spend her first 12 (very colicky) weeks with her. I get to work 10-5, so Chloe and I have extra time to hang out in the morning, instead of rushing around trying to get out of the house. At 5 when I leave, I truly leave my job behind. I don't have to think about it again until I get there the next morning, which is great when my night is already filled with Miss Chloe Mae. Hopefully next time something goes seemingly wrong in my life, I can remember that it'll eventually work out!! I see lots of pasta in our future!! Inspired by Melissa from "Next Food Network Star," who taught us that ratatouille has Eggplant, Zucchini, Peppers, Onion and Tomato (EZ POT) and because we had all but the eggplant ready for harvest in our garden, we (Aaron) made ratatouille last weekend. There was a bunch leftover and we didn't think it would reheat very well, so we pureed it and froze it for future use on pasta. It was quite tasty and I'm looking forward to having a nice sauce, chocked full of veggies for our pasta!! Now this weekend, we have a bunch of Roma Tomatoes ready along with some carrots, and of course, more zucchini. Aaron's currently roasting everything and then we're going to make more veggie-licious pasta sauce. We'll be set this fall/winter for lots of yummy pasta dishes!! We'll have even more tomatoes ready in the next few days, so if anyone has a great homemade marinara recipe, please share!! I thought this was a big'un... Oh how I was wrong. Aaron discovered this guy hiding in our broccoli the other day. We're starting to run out of ideas for using fresh veggies (last night we made green bean and zucchini tempura as our side - yummy!!) and freezer space. Oh what a problem to have. Our menu planning has been thrown out the window the last few weeks. We usually do 1 day of grilling, making extras so that we have a few meals throughout the week. We've also depended on the stockpile of freezer meals, so we haven't gone hungry by any standard. However, our meals haven't exactly been well-balanced on a regular basis. But now we're able to harvest from our garden, so that should all change. Tonight, we're having Crock Pot Chicken from the freezer with brown rice AND we're having salads with Bibb Lettuce and Zucchini and Grean Beans straight from the garden!! Aaron just pointed out a couple little zucchinis to me yesterday, so we didn't think we'd have any ready for another week at least. Then, when I was picking green beans today I noticed this giant and decided it was time to harvest it. I don't know how big they can get, but this one's significantly bigger than any I've ever purchased in stores. We're going to get dozens of zucchinis, so if you have any great recipes or would like any for yourself, let us know!! *For anyone who's known me longer than a couple years, did you think this phrase would ever come from me?!? Our current unit is 35 years old, so "it doesn't owe us anything" according to the repairman. The SEER (Seasonal Energy Efficiency Rating) on the current unit is a 6. That's assuming that it's actually working at peak performance, which it's obviously not since they're replacing it!! The lowest SEER on currently produced units is 13 and we're upgrading to a 15, so we should save a ton of money on energy costs. The rating basically means that for every watt of energy purchased for the unit you get that number of BTU's out, so we really can say that our new unit will be 2.5 times more efficient. All About Mama and BabyMort!